There are lots of cotton ones out there. I prefer some sort of dri weave, or mesh or nylon such as Champion.® Speaking of which, check out Champion's Site for a good education on different styles. They have a Friction Free® Running Seamless Sports Bra model. Fogdog also has a wide selection, just type in sports bra. Is Your Running Sports Bra Dead? - Do You Need A New Running Sports Bra? Find out in three easy steps! Security on the Run-Learn how to stay safe and secure on your runs. Reflective Running gear (shoes,clothing) is all the rage. Start here to educate yourself. Or, go to these sites and get what you need. Night Gear-reflective running. For running gear, instead of choosing cotton that stays damp when you sweat, choose newer fabrics that take moisture away from your skin and dry faster. No matter what our sport, the garment that is touching our skin we make sure is this kind of lightweight, highly breathable fabric. Search for keywords like "dri weave", "wick away", "nylon", "lycra", "microfiber" and "mesh". Champion just introduced a new line called "double dry." It works great for running, bras, shorts, tops. The main thing to look for in this type of clothing is either thin, breathable fabric or panels that pull moisture away from your skin. Next get a good fitting pair of running shoes. So go out there and get running! Running in a Road Race this year? Well run for a reason! Be an American Cancer Society Charity Runner and dedicate your run to those that have been touched by cancer. See Jane Run-San Francisco-area women's resource for clinics, training, clothing, and all else running (and now triathlon too!). 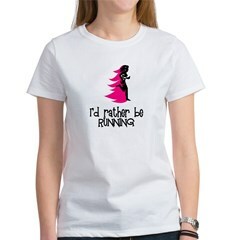 Speedy Sneakers-is dedicated to promoting womens' health and fitness for life through walking and running programs. Your Running.com-Share your passion here! GetSetUSA.com-Get information about running, walking, triathlon, duathlon, sports by selecting a state. Run the Planet-Where to run and walk in the cities of the whole world. Women's Distance Festivals-lists races that are women's races or has a special women's only start time or wave. GetSetCA.com-Get information about running in California. Team in Training -Walk or Run, Half or Full Marathons, 100-Mile Bike Rides and Triathlons. Want to run a marathon in all 50 states and the District of Columbia? Between The Miles-women's running blog. Hanne Lyngstad's blog gives good equipment advice. In her words, "I have learned to distinguish between a good shoe and a not so good." Part of Women Talk Sports Network. Women's Exercise Network-Don't Train alone. Find supportive people to talk sports with in an encouraging forum. Common Running Injuries-from Running 4 Women Website. EnviroSports-marathons, halfs, other races in CA with emphasis on running in nature. Running Shoes.org-resource for finding the best running shoes to fit your needs.